Your car is looking pretty grimy right now. While winter may still be bellowing away on your morning commute, as the adorable little rodents of Groundhog Day have partially indicated, the worst should nearly be over and we're soon on our way to sunshine, shiny cars, and saltless streets. Before we start heading for the nearest Canadian Tire to stock up on supplies for the annual clean up, it's time to first consider the one household ingredient known for its ability to bake delicious pies and make a poor man's toothpaste. We're talking about sodium bicarbonate, also known as, baking soda. Baking soda isn't just an ingredient to create things -- it's also notorious for being an extremely effective cleaning solvent that extends beyond the walls of the kitchen. It's a popular choice for where we're dirtiest the most: the car. 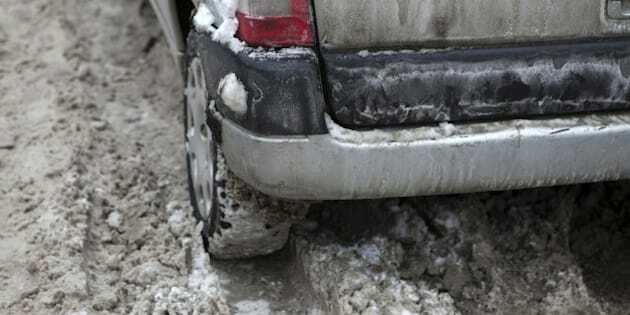 The winter season has a tendency to collect all sorts of dirty debris, from salt to grime to whatever can inconveniently latch onto your vehicle. Since I'm a man of action, let's skip the Bill Nye science and identify 10 parts of your car that can be cleaned with the magic white solution. You need to be able to clearly see the road. With the guck of winter shielding the light from full use, minimal visibility can put you in a ditch fast. As FabHow indicates in detail, it takes more than just two swipes from your snow brush to keep your passengers safe. If your car exterior comes with chrome bumpers or a chrome trim, you'll need to give that a proper shine as well. Nothing starts the spring season better than a shiny car, and unpolished chrome can really kill the vibe fast. All it needs is a little TLC. Grime can collect nearly anywhere, so it's important to remember the details. Similar to your chrome bumpers, any of the above areas can get a healthy tune up with a simple once over with baking soda and a sponge. Since many of you may have used your car this winter as your part-time mobile home this winter, your upholstery is sure to have attracted Pepsi spills, Big Mac sauce stains, and other accidental mishaps. If your seats are vinyl or fabric, you're in luck: baking soda is still your go-to option. If you've spent most of the winter puffing away, your ashtray may look like it's starting to grow into an unearthly symbiote. Although I'm sure many of you would prefer ashing out of the window, some of you may still need to get rid of the odour that can live dormant in your ashtray. You guessed it: sprinkle baking soda in ashtray. That's it. The baking soda will absorb the smells and odours, while keeping your car mighty fresh. Do you know of any techniques with household items to clean your car? Share them in the comments below!